After defending her Ph.D. in the field of bioorganic chemistry in 2005, Severine joined the Faculty of Pharmacy of Montpellier as a postdoctoral fellow. As part of the European project “Antimal”, her research work consisted in the development of new oral drugs for the treatment of Malaria. 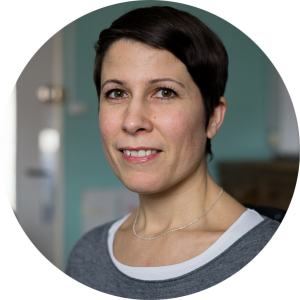 In 2007, Séverine started a two-year postdoctoral position at Harvard Medical School, Boston, MA, where she focused on the design and the synthesis of small molecules, namely diarylureas and oxindoles, for cancer therapy. In 2009, she became assistant professor in medicinal chemistry at the Faculty of Pharmacy of Montpellier where she joined the Institute of Biomolecules Max Mousseron (IBMM). Her main research project focuses on the development of ligands targeting the Ghrelin receptor (GHS-R1a), a GPCR that mediates growth hormone secretion, food intake, and reward-seeking behaviors. Because of its possible implication in several physiological disorders such as obesity and drugs/alcohol addictions, GHS-R1a represents a major target for the development of therapeutic small molecules. More recently, Séverine has also been interested in the development of new methodologies to access heterocyclic scaffolds such as [1,2,4]triazoles, diazepinones and triazole-ketopiperazines in order to find new potential lead compounds for therapeutic applications. Ben Haj Salah K, Legrand B, Bibian M, Wenger E, Fehrentz JA, Denoyelle S. Synthesis of [1,2,4]Triazolo[4,3- a]piperazin-6-ones: An Approach to the Triazole-Fused Ketopiperazine Scaffold. Org Lett. 2018, 20(11), 3250-3254. M. Maingot, A.-L. Blayo, S. Denoyelle, C. M’Kadmi, M. Damian, S. Mary, D. Gagne, P. Sanchez, B. Aicher, P. Schmidt, G. Müller, M. Teifel, E. Günther, J. Marie, J.-L. Banères, J. Martinez, J.-A. Fehrentz. New ligands of the ghrelin receptor based on the 1,2,4-triazole scaffold by introduction of a second chiral center. Bioorg. Med. Chem. Lett. 2016, 26, 2408-2412. S. Denoyelle, G. Tambutet, N. Masurier, L. T. Maillard, J. Martinez, V. Lisowski. Synthesis of Thieno[3,2-e][1,4]diazepin-2-ones: Application of an Uncatalysed Pictet–Spengler Reaction. Eur. J. Org. Chem. 2015, 32, 7146-7153. S. Denoyelle, T. Chen, H. Yang, L. Chen, Y. Zhang, J. A. Halperin, B. H. Aktas, M. Chorev. Synthesis and SAR study of novel 3,3-diphenyl-1,3-dihydroindol-2-one derivatives as potent eIF2·GTP·Met-tRNAiMet ternary complex inhibitors, Eur. J. Med. Chem. 2013, 69, 537-553. T. Chen, D. Ozel, Y. Qiao, F. Harbinski, L. Chen, S. Denoyelle, X. He, N. Zvereva, J. G. Supko, M. Chorev, J. A. Halperin, B. H. Aktas. Chemical Genetics Identify eiF2α Kinase Hemeregulated Inhibitor as an Anticancer Target. Nat. Chem. Biol. 2011, 7(9), 610-616.